Honda has made “great steps forward” and is “a lot stronger than they get credit for”, according to one of the manufacturer’s Formula 1 midfield rivals Marcus Ericsson. Pierre Gasly’s two-point haul in Belgium two weekends ago took Toro Rosso and Honda to 30 points, the same as McLaren scored throughout the whole of 2017 in the last of its three dismal years with Honda, as it prepares to supply the senior Red Bull team next year as well. While Honda has kept its developments under wraps this season, it has made considerable gains in driveability since last year and introduced a combustion engine upgrade in Canada. This has been followed up by smaller developments that have not triggered combustion engine changes or new energy recovery system components. Sauber driver Ericsson bore the brunt of Honda’s progress at Spa, where he was surprised by the straightline speed of the Toro Rossos, even accounting for their DRS use. 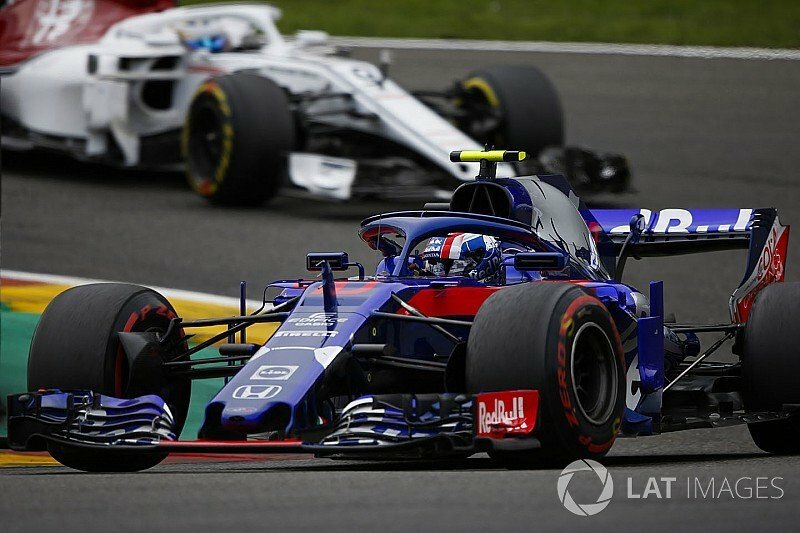 “I was in the DRS [zone] of Gasly and I couldn’t overtake him, I couldn’t even get close,” said Ericsson, whose Sauber did suffer from more drag at both Spa and Monza. “I think that shows quite a lot that Honda has made great steps forward. I still believe Mercedes and Ferrari are the two strongest power units but then Honda is a lot stronger than they get credit for. While speed trap figures can be misleading, Honda has trimmed its top-speed deficit year-on-year. Gasly followed up his Belgian Grand Prix result by making it into the final part of Italian Grand Prix qualifying at Monza as Honda’s engine stood up to the test of two of F1’s most power-sensitive circuits. Its reliability has also been much better this season, with Max Verstappen pointing out that its increased engine component useage compared to rivals is a red herring because Honda has made tactical changes on bad weekends to increase the components in its pool. As well as running the engines harder, Honda has also reacted to deficiencies exposed by the Azerbaijan GP earlier this season. It has since developed its energy deployment strategy and adapted its communication between team and drivers. This has combined to facilitate Honda’s encouraging performance despite waiting to introduce a final major upgrade of 2018. Unlike Mercedes, Ferrari and Renault, Honda did not introduce an upgrade at Spa or Monza but Gasly still outqualified both Williams drivers twice, plus a Force India, a Haas and both Saubers in Italy. Honda also had the edge on the Renault works team in Belgium and its customer McLaren in Italy, although both had Renault’s previous-spec engine. “As a package, including the energy management, it worked well,” Honda technical director Toyoharu Tanabe told Motorsport.com.